EDUARD ABRAMIAN (1923-1986): Preludes No. 1 in E Flat, No. 2 in C, No. 11 in F Sharp Minor & No. 13 in A, ARNO BABADJANIAN (1921-1983): Capriccio, Improvisation, Folksong, Elegy, Poem, SERGEI RACHMANINOV (1873-1943): Sonata No. 2 in B Minor, Op. 36. Description: The good news here is that the Armenian stuff beats the Rachmaninov by 34 to 22 (min.). One or two of the Babadjanian pieces are otherwise available but none of the Abramian which are all based in Armenian folk music. All tonal, the Babadjanian are less firmly derived from folk sources but are very approachable and winning pieces in their own right. 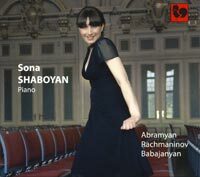 Sona Shaboian (piano).